It was around 6.30 PM on a windy Friday night, even in my weakened body I forced my way to find a new culinary experience. It was a short walk around 500 meters from my workplace but in my current condition, it was quite tough. I still got 2 hours less before leaving for Bandung so hey, why not indulge yourself a bit for a change? And at last I arrived at the place, an old-fashioned Japanese company kind of office premises with the stern look, rigid architecture, quite similar with my workplace but somehow a bit friendlier, well… at least. Anyway, the building’s name was Wisma Kyoei Prince. The home of JAL or Japan Air Lines representative office here in Jakarta alongside with many other Japanese companies. They got Oh La La Café on the 2nd floor here, but to think that we also got one too back at my workplace, Coffee Bean & Tea Leaf. Anyhow, still I might pick City Loft for more choices or a quiet coffee-sipping in BNI’s Starbucks or just be like all the Jakarta people, just drop by at your favorite mall for that! Haha..
That day marked my visit for the third time to that building. Two last visits were for Goemon (will be posted later). The first time was probably around many months ago, when I also had this adventuring by myself. It was originally intended to visit Sushi Ippachi but I happened to take the wrong door and ended up in Goemon because of lucky accidental reason. Hehe… Okay, so now that I had picked the right place this time, I read the menu first. Hmm.. Seemed to me, it’s more expensive than Goemon. For example, the average price for Teishoku (Japanese lunch set) Menu in Goemon is about IDR 50,000 up to IDR 70,000 excluding tax. But the average in Sushi Ippachi is above IDR 80,000! Judging from the name itself, I guess they specialized in sushi or sashimi in sort. 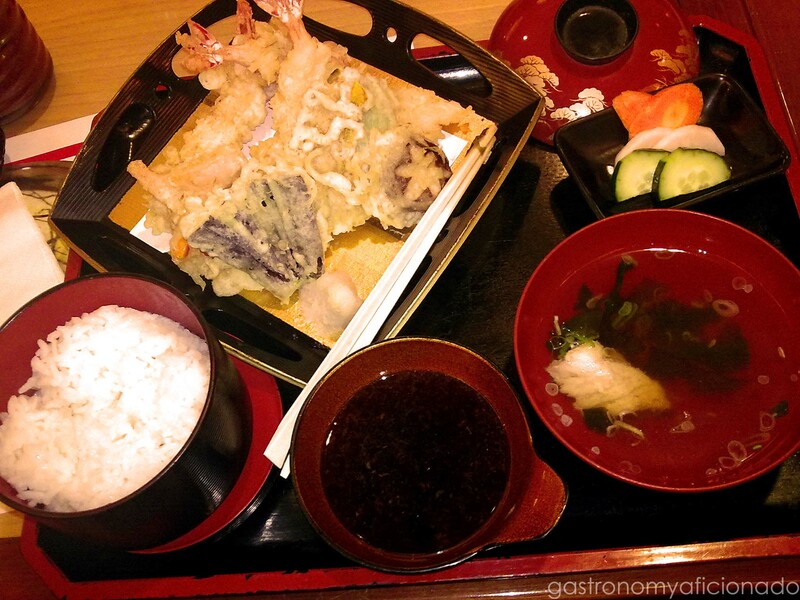 Plus only some restaurants serve Teishoku at lunchtime only. 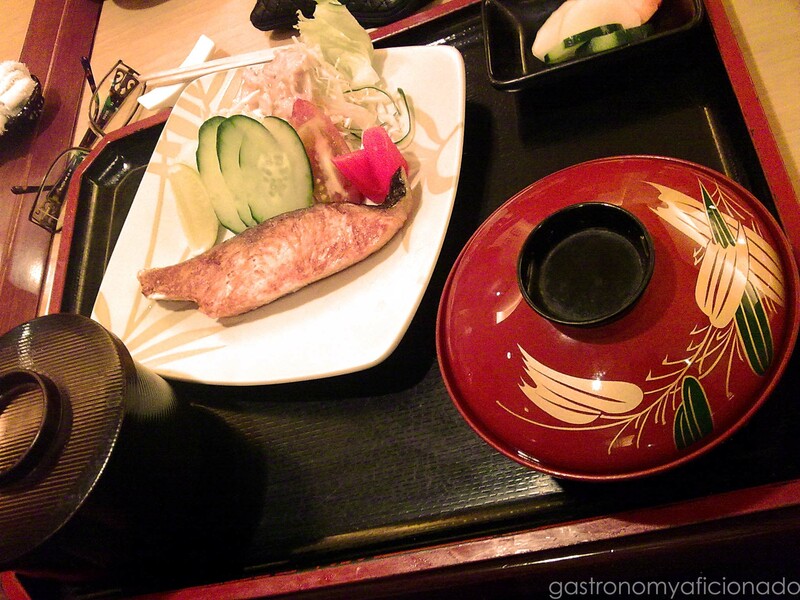 Teishoku has always been the best pick for the taste test in Japanese restaurants for me. Anticipating the unavailability, I browsed through again the menu and found myself, the dinner section! There were indeed many dinner sets here. Most of them were the combination between sushi and sashimi or sushi and tempura plus the details (in-between IDR 100,000 – IDR 200,000). Deadly, but hey! Don’t forget why I came here in the first place. To quench my insatiable appetite for something new! So then I entered the place with full confidence with warm greetings from the waitresses. I was seated directly on the sushi bar. 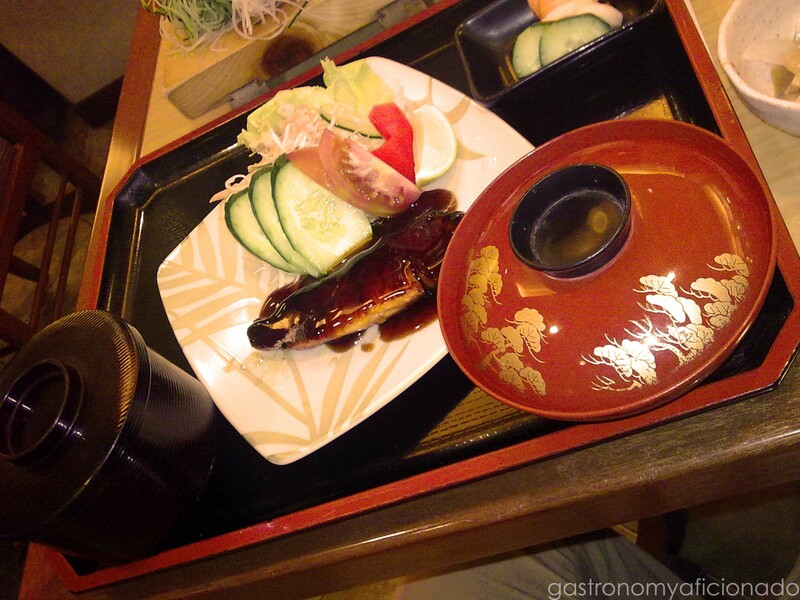 This place was well-designed, bright, warm, has the tatami private rooms, and quite spacious. But the cool thing was that Sushi Ippachi has 2 bars, one for the ‘beer bar’ and the other one for of course, the ‘sushi bar’. With 3 small televisions can be seen from 3 angles. That means a lot when you’re coming in by yourself. I was served right away with the appetizer in a small cube-shaped bowl filled with diced potatoes, carrots, and boiled tuna dipped in sweet sauce. 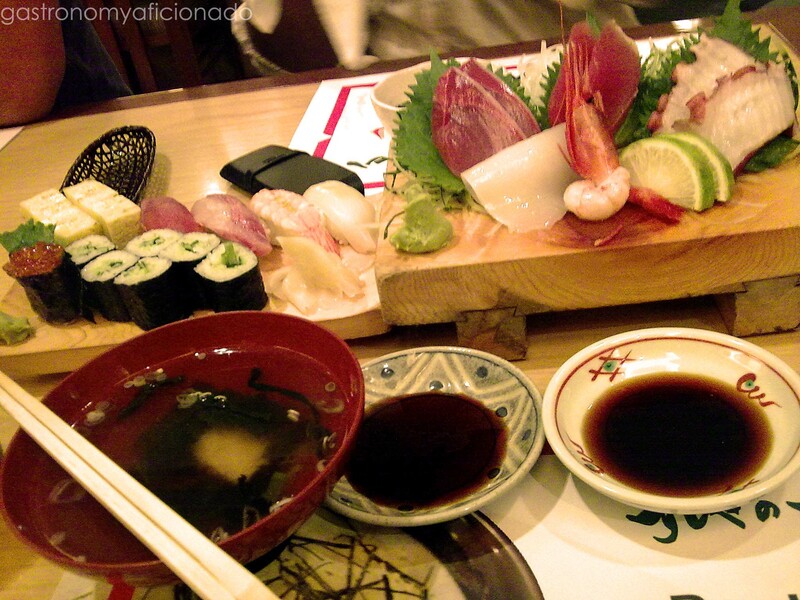 These kind of appetizers in Japanese restaurants usually change daily. One day you can find this kind, another day probably pickles, a small portion of nikujaga (a dish of meat, potatoes, and onion stewed shoyu sauce), small oysters with shoyu (Japanese soy sauce), or anything. Plus of course the hot ocha (Japanese green tea) and a warm towel! Ahhh… That washed away my fatigue. Afterwards, I browsed the menu again, asked whether the Teishoku menu still available and it’s a no, so then I picked myself a moderately priced (among others… you can imagine…) Sushi and Tempura Set D for around IDR 180,000++. First thing first, the sushi dish came, consisted of 10 different assorted sushi added with sliced ginger (which I’m not quite fond of, only Moms do, based on my research) and accompanied with wasabi (a Japanese horseradish used as a spice and has a strong flavor, sort of Japanese sambal). Please don’t be fooled by Sushi Ippachi’s wasabi. It’s so real, way too real comparing to Sushi Tei’s. This time you’ll get the Real Wasabi Strike feeling which smashes you right away from your tongue up to your spine. BANG! First thing first after receiving such strike, you should relax yourself a bit, exhale, and let your eyes water. Drink a bit if necessary. It’s only natural, no need to worry. Haha.. Well, after recuperating from it, I decided not to get carried away by my overconfidence again and start eating normally with only adequate amount of wasabi for each of my sushi. I tell you what, all of them tasted great! I got the feeling that all of the components that made this wonderfully designed food were very fresh. One of the senior chefs there even remarked that the freshness of the ingredients is their number one priority. The supplier comes every 2 or 3 days to replenish the foodstuffs. Meanwhile, I was wondering where on the earth is the tempura dish? I decided to spare some of the sushi because my stomach getting kinda full surprisingly. So I don’t want to mess up by not preparing for the worst. Well… If you mean the worst, then suddenly one of the waitresses brought a plate full of tempura of several kinds! Probably around 5 big tempuras! There’s the shrimp, cassava, spinach, and the onion. To make things even better, all of it was also accompanied by a chawan mushi (egg custard with various ingredients) and a miso shiru (traditional Japanese soup). Wow!! Not bad for a quite overpriced restaurant. Then after struggling a bit, I managed to finish all of ’em! Satisfying in terms of taste, but in terms of price… well… Overpriced! I spent around IDR 200,000 in total only for a set menu for one person. Probably would be wiser if Sushi Ippachi reshape their price tags because their nearby competitor seems to attract more customers than they do! So after an enjoyable chat with the chef there, I decided that I’ll do another visit (dunno when though…) to totally get a grip on the food and probably understanding more why they put hefty price tags for each of their dishes. Well, from my point of view, you should try at least once here. Probably you gonna feel sorry the first time you take a seat there and taking that painful glance at the price plus knowing that there’s no escape. 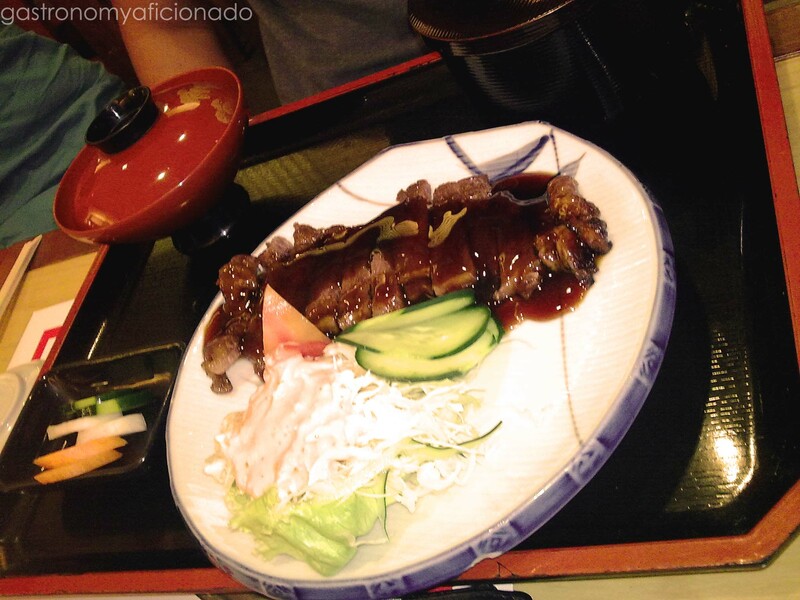 Therefore, I recommend you to stay, pick your dish carefully, and enjoy your patronage there. In other occasion, driven by lust, maimed by the half price discount over a certain credit card promo (HSBC to be exact. Hehe..), an angry mob of hungry people (count me as 2 or 3 persons) decided to visit this place. Since it’s like a lifetime offer, I put an order over a this time a Sushi & Sashimi Set 3 which cost originally around IDR 200,000. My pals picked a more conservative dishes (which either they felt safe to pick it or because they knew about it already), cheaper, and probably edible in their point of views. Which I found a bit waste coz those turned out to be not that tasty and definitely not in tune with the theme of the day. Discount! So why pick a cheaper one when you can pick a more expensive but exotic which will ultimately be reduced for 50%! Well, anyway, some of them ate the Gyudon (IDR 88,000), the other picked Assorted Tempura (IDR 110,000), Beef Teriyaki (IDR 110,000), Salmon Shioyaki (IDR 88,000), and Salmon Teriyaki (IDR 88,000). All without rice (to ring you a bell that there’s no Teishoku at night) save the Donburi. Bowls of rice for 5 cost around IDR 75,000. Jeez! Whilst mine, of course, was the most exotic, good-looking, and the tastiest of course. Plus it’s a bit extraordinary for the sushi chef who still able to recognized me despite the margin of several months from my last visit plus I managed to customize a bit about the composition of my dish. Haha… I added a bluefin tuna (Kanpachi) into my dish. 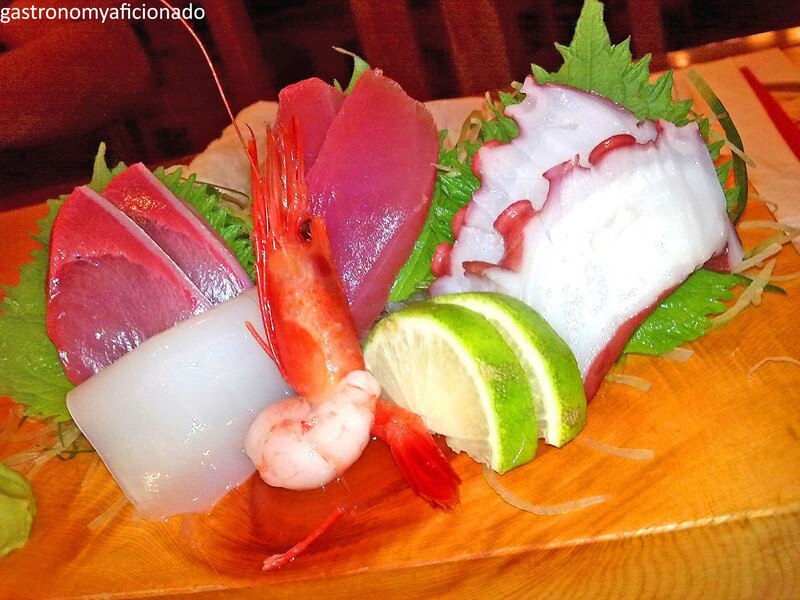 Adding new things into your sushi experience would surely be fun! Quite comfy, I got the Japanese feeling kind of restaurant. Not too special though. I gotta try the tatami room next time. Typical and standardized Japanese restaurant service. Thanks to the chef for the insightful conversations about the Japanese restaurant management. I still haven’t got the grip about the sushi. Perhaps I need to compare it more to other more native-oriented restaurants. But so far, this place serves delicious and fresh sushi. Some Japanese customers that time happened to ordered the sashimi and judging by the looks, well… well… Looks like I need to go for another visit there. Too pricey because you can get the same menu or combine between the sushi and the tempura set but still you’ll get cheaper price somewhere else. I wonder why you guys closed the one at BNI 46 Tower? Nobody came because it’s too expensive? But looking at the bright side, you guys serve decent food. At least my stomach is full. But I seem to forget that perhaps this restaurant emphasizes more for native Japanese customers with a price like this, but still… your neighbor offer a better price and good foods too! Promotion : Periodic 50% discounts for HSBC cards.